At its peak in the 1930s, the German chemical conglomerate IG Farben was one of the most powerful corporations in the world. To this day, companies formerly part of the Farben cartel—the aspirin maker Bayer, the graphics supplier Agfa, the plastics giant BASF—continue to play key roles in the global market. IG Farben itself, however, is remembered mostly for its infamous connections to the Nazi Party and its complicity in the atrocities of the Holocaust. After the war, Farben's leaders were tried for crimes that included mass murder and exploitation of slave labor. 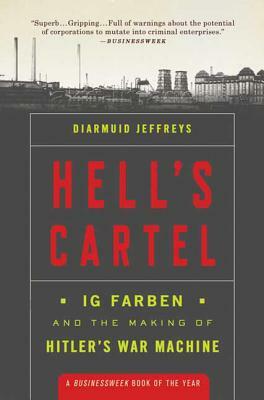 In Hell's Cartel, Diarmuid Jeffreys presents the first comprehensive account of IG Farben's rise and fall, tracing the enterprise from its nineteenth-century origins, when the discovery of synthetic dyes gave rise to a vibrant new industry, through the upheavals of the Great War era, and on to the company's fateful role in World War II. Named one of the best books of the year by Business Week, Hell's Cartel sheds new light on the codependence of industry and the Third Reich, and offers a timely warning against the dangerous merger of politics and the pursuit of profit. Diarmuid Jeffreys is the author of Aspirin: The Remarkable Story of a Wonder Drug, which was nominated for the prestigious Aventis Prize for popular science books and chosen as one of the best books of the year by the San Francisco Chronicle. A journalist and documentarian, he lives in East Sussex, England.